As foreign countries continue to repatriate their gold reserve from the US Federal Reserve, the US economy and dollar are growing weak. Why Are Foreign Countries Repatriating Gold From US Federal Reserve? The London Metal Exchange (LME) is severely lacking gold reserves, as recently China and India have been actively buying gold, financial analysts said. As a result, these days gold is high in demand. The US Federal Reserve, the world’s largest depository of gold, has seen growing numbers of requests to repatriate gold from European nations. Now, the gold reserve in the Fed has reached a record low over the last 30 years. In periods of crisis, world powers usually support their economies and national currencies with the purchase of gold reserves. That helps to cut the country’s reliability on the dollar as gold remains one of the most reliable assets in the market. Currently, due to the global economic slowdown, countries are making efforts to repatriate their gold from the Federal Reserve. For instance, over the last year nearly 250 tons of gold have been taken from the US depository. In order to support growth, the Netherlands repatriated 120 tons of gold, 20 percent of its reserve reserves. France and Germany also took back a large amount if their gold reserves. According to financial experts, the US economy is currently under great stress. In addition, it was reported that the US had allegedly sold a large amount of its gold reserves. 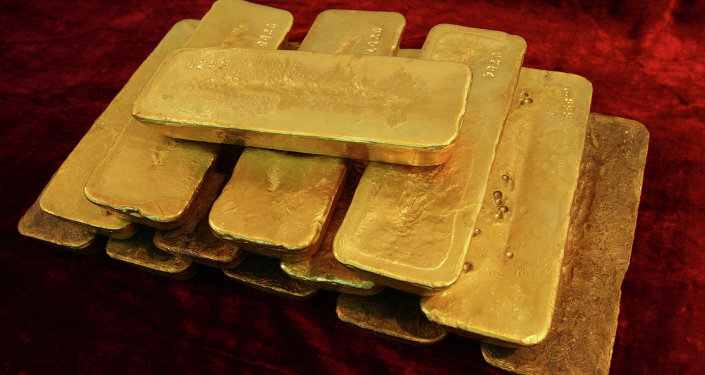 Currently, the Federal Reserve stores 530,000 gold bars, and the US owns only 34,000 of them. The more gold countries demand from the US, the more unstable the American economy becomes, which could in turn seriously threaten the stability of the dollar, experts warned. Russia is the world’s sixth-largest holder of gold reserves, 1,200 tons. Over the last five years, Russia has increased its gold reserves by nearly 80 percent. In the long run this could guarantee the stability of ruble.